What is the CHEAPEST way to add Toyota smart keys? 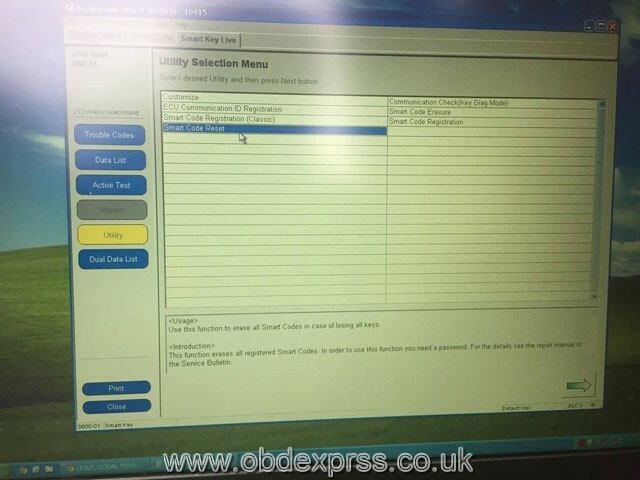 There are optional solutions to make new keys to Toyota with Techstream software or some auto key programmers. Some by the dealer, some diy. Here, you will get the cheapest way to make it. This was quoted at ~$400. I called 2 local dealerships (I’m in the GTA) and was quoted 2 different prices, with the second dealership referring me to an agent (which I had previously found online). This was quoted at $250 but I’ve only found 1 so far. I was told it was an OEM part and would have 6 months of warranty. Any referrals in the GTA would be much appreciated. Edit: After a number of calls, the cheapest I could find was $180 and $200. I see that I can buy the Smart Key online for about $110 and bring it to a dealership or agent/locksmith to have it programmed into the car. I was quoted $50 by the dealership. Any referrals to purchasing OEM Smart Keys online would be much appreciated. If you have a laptop, Techstream software, a connecting cable, and the Smart Key, you can DIY. Its unclear whether the “Ignition Key” portion can be DIY with Techstream (someone please clarify). If you cannot, this seems to defeat the benefit and would seem more beneficial to pursue the Partial DIY option above. The website for Techstream shows a subscription model with varying options. I’ve looked at few posts in the forums but overall am lost on the full DIY option. Confirmed possible! Requires a SEED code calculator which is another $15 for 1 code. The cheapest should the fourth solution: full do it yourself to make a new key. Here is the how-to’s for reference. Smart Key: The circuit board # inside the to-be-programmed Smart Key matches your existing key(s). Once you have everything ready to go, start your car and launch Techstream. Leave the driver’s door OPEN for the entire duration. All of the ECUs will be yellow. 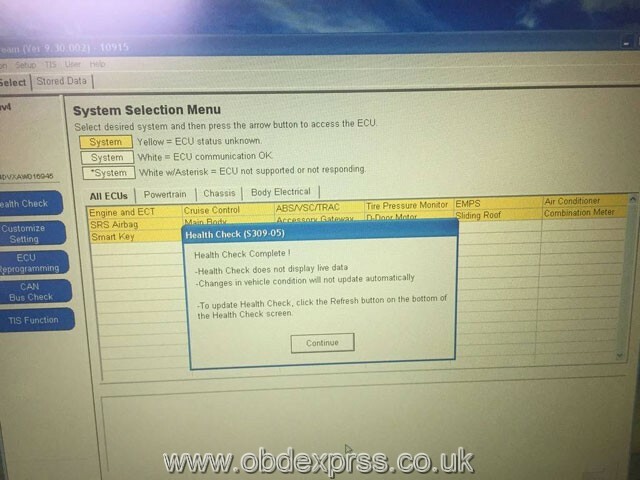 You can click “Health Check” to have Techstream go through each of the ECUs and determine its status, which takes a few minutes and will change their colour. If you decide to skip the “Health Check”, you can still click on the individual ECU you’re looking for and it will read only that specific ECU (you’ll be waiting a few seconds instead of minutes, its basically the same as the “Health Check”, but only for that ECU). Once in there, select “Utility” on the left-hand side and you will arrive at this screen. Now, if you had a NEW Smart Key, the process is relatively straight forward. You can simply click on the “Smart Code Registration” option, which there are 2 of. Both options work, the Classic is older and has less explanations, while the new one has more text and is more user-friendly. The steps basically consist of; 1.) only have 1 Smart Key in the car at a time, 2.) first start with the Master Key (existing key) and tap it on the ignition button, 3.) remove the key (more than 1 meter from the car) and bring the NEW Smart Key inside, tap it on the ignition button. 4.) Place the NEW Smart Key on the passenger seat until prompted otherwise. 5.) Done. 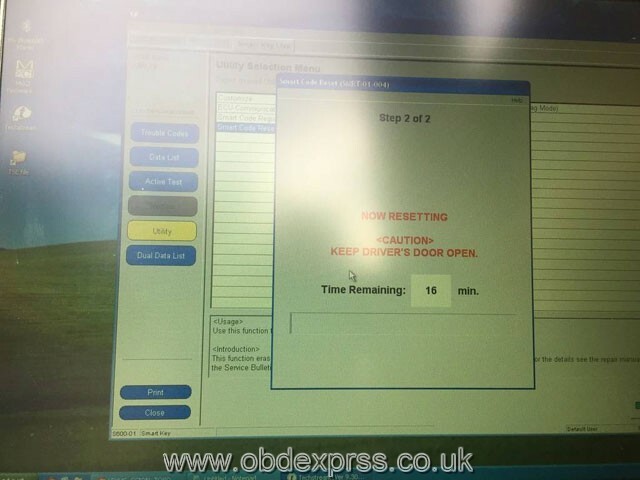 All of the steps need to be done within 30 seconds of each other, as indicated on the screen (there will be a counter counting down). 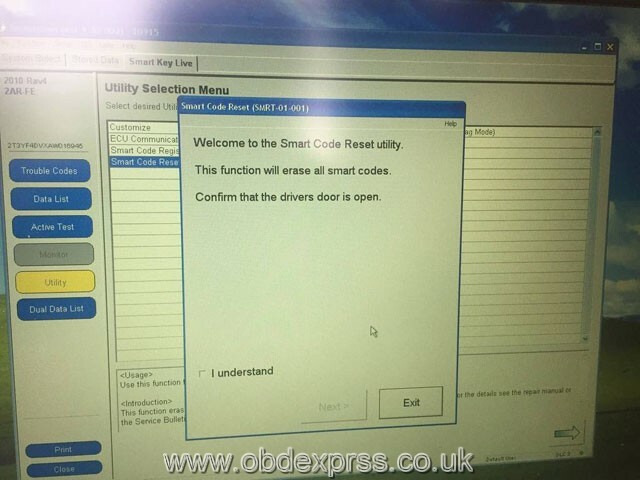 Within the “Smart Code Reset” function, you will arrive at this screen. You can click on the “Get Pass-Code” button, which will take you to another screen that allows you to copy the 96-digit SEED code (the first one doesn’t seem to let you copy, despite being able to click on it). Do not close the Techstream window that has the SEED code displayed (the first one).Techstream generates a new SEED code every time you enter the function, so if you close out of it, you lose that session. 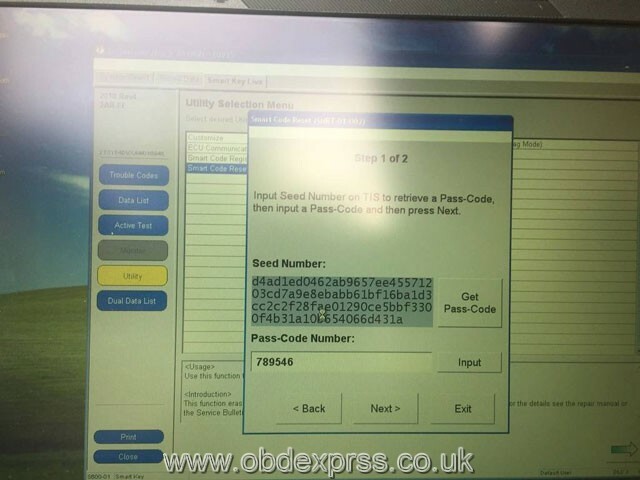 If you re-enter it, a new SEED code will be supplied and any SEED passcode you received from a calculator will be useless (you can’t re-open a previous session). NOTE: While you may read in Techstream that its recommended to avoid having wireless devices such are cell phones or your PC’s WiFi on when registering Smart Keys, I had my laptop with WiFi turned on for the entire process and didn’t encounter any issues or interference. 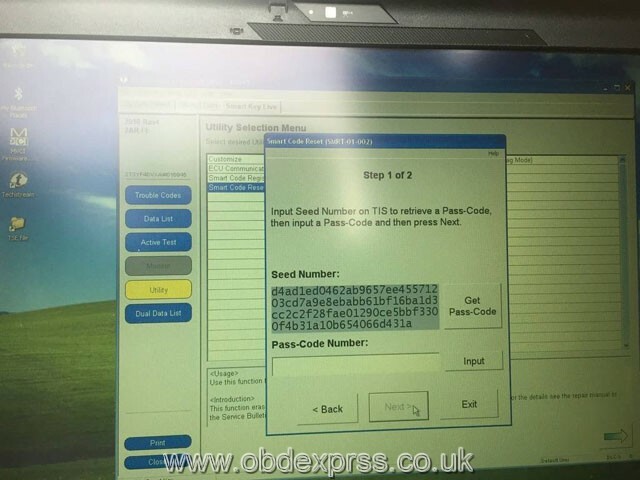 With respect to supplying a calculator with your VIN# and SEED code, I would highly recommended that you do all of it through copy-paste instead of manually typing. This would help you avoid any unintentional typos (as that would end up costing you money for a new SEED passcode). You now need to go to one of those “calculator” websites I mentioned (www.Pin-Online.net (was $15 USD) or www.weboctopus.nl (25EUR for 5 codes) and paste your VIN# and SEED number. When I used weboctopus.nl, the 6-digit passcode was generated instantly. Reminder #1: Do not close the Techstream window that has the SEED code displayed (the first one). You can then go back into Techstream and paste the code in. Reminder #2: Remember to leave the driver’s side door OPEN. Do not close it as it will interrupt the reset procedure. If the function fails for whatever reason, DO NOT CLOSE THE DRIVER’S DOOR. You may still be able to try again or carry through with the remaining steps successfully (other post’s have reported so). You will then arrive at this screen, where you simply wait for 16 minutes. I suggest you stay nearby (I was playing a game on my phone) and set an alarm a minute before you expect the timer to end and avoid touching or moving anything (I left the laptop on the car seat and sat on the ground outside, most specifically because my particular cable was defective and had a loose connection, so I wanted to avoid any movement that may risk losing the connection). Once the timer ends, it will tell you the procedure is complete (successfully)… but you’re not done yet! In order to register your keys, you now need to select one of the other options (I chose “Smart Code Registration (Classic)”). Note #1: Previously, if you used this function, you’d choose the first option (“I am just registering keys”) but it would fail if you were trying to register a used Smart Key. Now you will select the third option instead. Note #2: In case you’re curious, choosing the third option before performing the “Smart Code Reset” will simply result in an error before you even get to load the function. It will produce a message to the effect of “Cannot initialize, reset function not detected”. When you hit next, you will be asked to eventually tap the key on the ignition button. It has been recommended by other users that the USED key be tapped first and any existing (previously linked) keys to be tapped last. After this is done, you can click “Register” to finalize the session.